One of the main problems that atheists have is prejudicial conjecture. That is, they get all het up, thinking they know about something and spouting off their uninformed opinions while also trying to influence the views of others. When it comes to the Bible, many atheists not only resort to prejudicial conjecture, but many other logical fallacies including the straw man. Sorry, Cupcake, but we don't have to defend something we don't hold to or didn't say. This includes quote-mined material from the Bible. Numerous fallacies can be rounded up in regards to creation science. 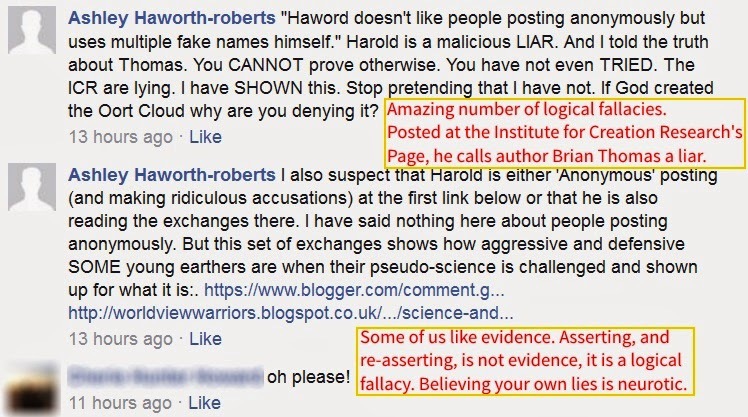 They will misrepresent creationists, call us liars (their "proof" is essentially based on "because I said so repeatedly", but actually makes them the liars because of no real evidence), appeal to motive, poisoning the well, unfounded accusations, loaded terminology and a whole lot more. With just a little learning about informal logical fallacies, it's easy to spot atheopaths using numerous errors in what passes for reasoning on their world. This is "Fair Use" for educational purposes. Also, I see that someone didn't cotton to Haywire's rants. Another trick is redefining words to suit their purposes. The established definition of atheism is someone who believes there is no God or gods. Since that fails logic and philosophy tests, they have conveniently redefined it into someone who "lacks belief", but they are still making a belief statement. (Fine, I lack belief in a universe without God.) Since atheism is such a negative religion, it has been also redefined as secularism or even secular humanism, but both terms still come down to meaning "atheism". "Secularism" is not "neutral"; secularists keep working on removal of all vestiges of Christianity in public life. That is an establishment of an atheist religion, not "neutrality"! One of the most popular efforts of quote mining by atheists in America is the so-called "Constitutional separation of church and state". Many people believe the lie that this is in the US Constitution. I remember some of a conversation about 30 years ago, I said to a guy, "The Constitution says that the church shall be separate from the state, and the school from the church". The other guy said, "Yes!" Then I informed him that I was almost-quoting from the USSR Constitution (it's in the 1936 and 1977 USSR Constitutions). He didn't like that trick, but it showed how he had accepted a belief without truth. The fact is, despite the manipulations and trickery of secularists, there is no such thing as the separation of church and state in the US Constitution! But atheist-sympathizing judicial activist judges in this country act like it's there. Let's get back on the original trail again. Atheists and other anti-creationists give uninformed opinions when they attack Christians and biblical creationists. Some think they've found problems with the Bible, therefore there is no God, but their objections have been answered long, long ago and answers are posted online. Very few have the intellectual integrity to honestly investigate from the sources about what we believe and teach. They get their information from other atheopaths and anti-creationists who misrepresent us, or just base their opinions on watching or reading secular humanist-based science fiction. How about going to the source instead of fallaciously paying attention to poorly-thought second-hand opinions? There really is a Creator, and he makes the rules. We are all going to be answerable to him one day. For some of us, it will be a joy. For others, it will be Hell (Phil. 2.9-11, Rev. 20.15). 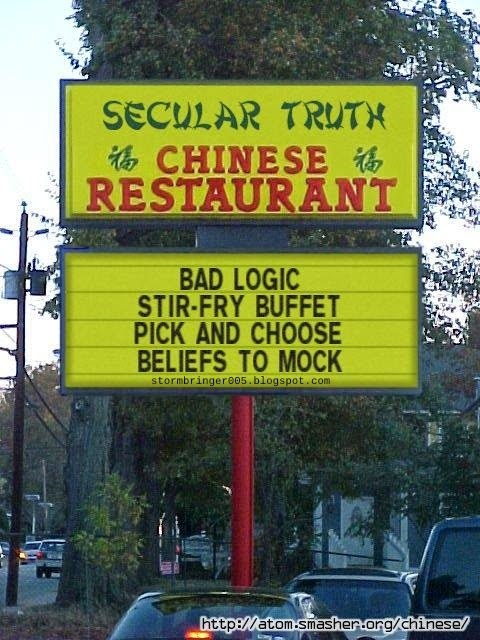 By denying God, you're making your choice with your pretended "secular" neutrality. Wild Bill Finlay is an American Conservative commentator and a Christian. He has some good observations in this short video.